With the regular season just weeks away, the Patriots are preparing for life without Tom Brady. As it stands today, Brady is still facing a four game suspension although it is rumored to possibly be shortened. 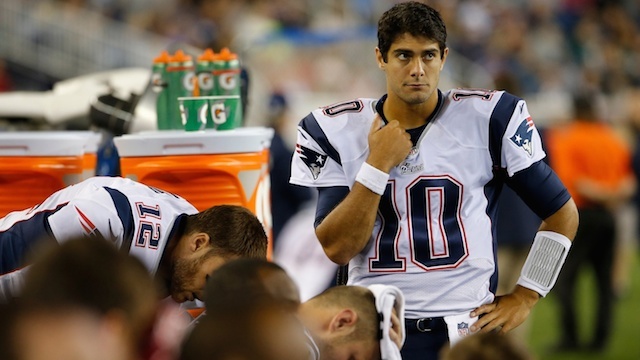 Next on the depth chart at quarterback is 2nd year player Jimmy Garoppolo out of Eastern Illinois. Does that school sound familiar? Tony Romo went undrafted out of Eastern Illinois and panned out pretty well for the Dallas Cowboys. Garoppolo was selected in the 2nd round of the 2014 draft and is preparing to fill Tom Brady’s shoes while he’s out. With just 19 career completions, can Garoppolo succeed for the New England Patriots? Although he has just 19 completions to his name, Garoppolo has played well in his limited experience. He completed 19 of 27 passes (70.4%) for 182 yards and one touchdown, a quarterback rating of 101.2. Now these numbers come from no-pressure situations. The bulk of his work come from a blow out loss to the Chiefs, a blow out win over the Bears, and in a game that didn’t matter at the end of the season to the Bills. It’ll be interesting to see how he fairs when the slate is wiped clean and every game matters. At running back, Garoppolo should have a trio of running backs to help him out in LeGarrette Blount, Jonas Gray, and Travaris Cadet. He’ll have All-Pro tightend in 6’6″ Rob Gronkowski who should make for a great red zone target. At receiver, he has the reliable Julian Edelman who accounted for 92 receptions last season as well as Brandon LaFell who finished strong to the tune of 74 catches, 953 yards and 7 touchdowns. If the Patriots can tap into the potential of Josh Boyce and Aaron Dobson this season they’ll have a formidable group at wide receiver to give a young Garoppolo. Let’s not forget about Reggie Wayne whom the Patriots just signed. It’ll be interesting to see how quick he can pick up the playbook and get into game shape. I would not expect too much out of him early in the season. With this kind of offensive personnel in place, Garoppolo should be fine. If he struggles, it may be a testament more to how good of a quarterback he can be in the NFL. Heading into the 2015-2016 season, the Detroit Lions have a crowded backfield. In today’s NFL, that’s not a bad thing. Many teams are moving to the running back by committee model. In this model, teams can not only keep fresh legs on the field at all times, but they also believe they can prolong the length of an NFL running back’s career. Many of these backs today begin to decline by age 27 or 28 when athletes in other sports would be just hitting their prime. Let’s take a look at who is expected to be splitting the carries for the Lions this season. Bell shared the carries last season with Reggie Bush who is now with the 49ers but for the most part was the lead back. Bell was given 223 carries to Bush’s 76. Both managed a pedestrian 3.9 yards per carry but Bell managed 8 total touchdowns (7 rushing, 1 receiving). Bell showed great flashes and even proved to be a threat receiving the ball out of the backfield compiling 34 receptions for 322 yards. Bell figures to get a good share of the carries, especially between the tackles but there is a rookie right behind him in the pecking order. The Lions selected Abdullah with the 54th overall pick in the 2015 draft. Abdullah had a decorated career at Nebraska rushing for over 1,600 yards in both his junior and senior season while also eclipsing 1,000 yards as a sophomore. For his career at Nebraska, Abdullah ran for 4,588 yards and 39 touchdowns. A threat in the passing game as well, Abdullah caught 73 passes for 690 yards and another 7 touchdowns. As a 2nd round pick, Abdullah will certainly be given his opportunities. Riddick was selected in the 6th round with the 199th pick in the 2013 draft out of Notre Dame. He has not been much of a threat on the ground garnering 29 carries for 76 yards and 1 touchdown in his first 2 seasons in the league. He has however found a niche as a 3rd down back being a safety valve in the passing game for Matthew Stafford. In limited time in 2014, Riddick caught 34 passes for 316 yards and 4 touchdowns. Riddick will certainly find ways to get on the field this season because of his ability to make plays. Another name to look out for is rookie fullback Michael Burton. Burton was selected in the 5th round (168th pick) in the 2015 draft out of Rutgers. After playing his senior season at 232 pounds, Burton weighed in at 242 in his pre-draft measurables and showed up to camp at 250. Burton has added the needed muscle to play fullback in the NFL. Primarily a lead blocker, Burton to manage to showcase some offensive skill in a poor Rutgers offense during he tenure. He managed 47 receptions for 401 yards and 3 touchdowns through the air and had 22 rushes for 116 yards on the ground. With an offense that allows him to do more, Burton could be a hidden option for the Lions. NBA free agency has slowed down quite a bit as rosters have moved closer to capacity and cap room has thinned. NBA teams are allowed to give training camp invites and carry up to 20 players prior to cutting down to 15 to start the season. There are many young players out there still that are worth taking a look at. If they don’t like what they see, they can simply not include them in their final 15. Let’s take a look at some of these players. 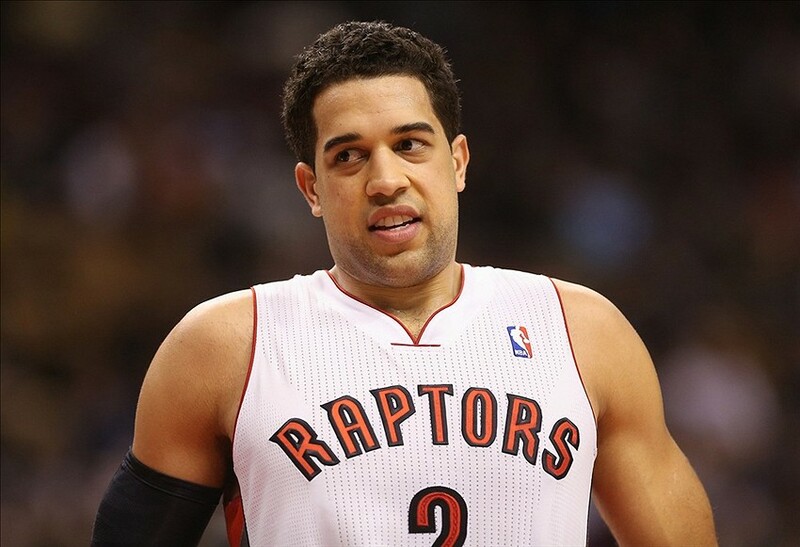 At just age 27, Landry Fields still has some upside to him. Since leaving the New York Knicks, things have not quite gone his way. He has suffered an injury to his shooting arm that may have derailed his NBA career. Last season he averaged just 1.8 points per game in 26 games during his final season in Toronto. Fields is currently learning how to shoot left handed and is worth a look in training camp. Hamilton has bounced around the NBA in his short career in the NBA and that’s a product of leaving college too soon. Hamilton played one great season for the Texas Longhorns and was the 26th pick in the 2011 draft. He has played for three different NBA teams and is still just 24 years old. He possesses great size at 6’7 and at times has shown he can shoot from outside. He definitely still has upside to be tapped into. It’s rumored he has signed a deal to play in Russia. Maybe he’ll prove his abilities overseas and find his way back to the NBA. You probably remember Cole as that point guard from the Miami Heat with the flat top hair cut. 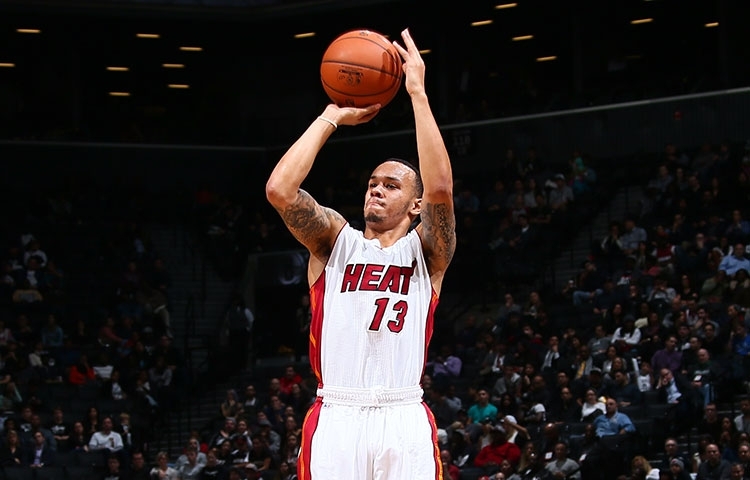 Cole was traded at the deadline last season to the New Orleans Pelicans and averaged just under 10 points per game. At age 26, Cole still looks to be deserving of a backup role on an NBA team. Someone should give him a chance.